Redesigned banners up on Comm. 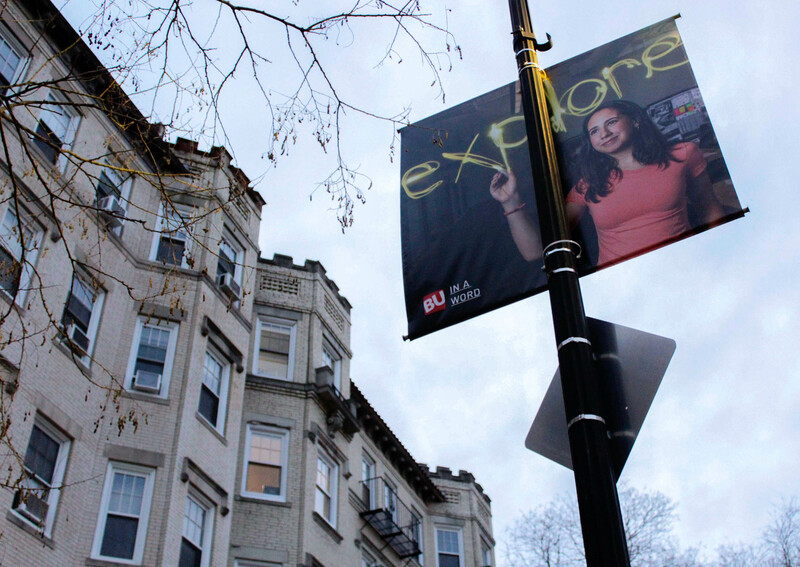 Ave.
New banners are up this week on the lamp posts along Commonwealth Avenue, showcasing photos of students using light trails to draw out a word they’d use to describe Boston University. The new “BU in a Word” banners replaced older banners that were first put up in April 2016. The older banners showcased photos of students alongside a quote detailing a notable accomplishment from their time at the university. Ellie Steever, a senior designer at BU who has worked on campus for about five years, said she was tasked with redoing the Commonwealth Avenue banners about a year ago. Steever said she finished the banners a few months ago but had to wait until the weather warmed up to showcase them, as winter winds could have made them a safety issue. The inspiration behind the banners, Steever said, was the idea of what it means to be a student. “We thought it would be cool to just gather a group of students and ask them, ‘If you could sum up your experience or your thoughts about BU in one word, what would it be?’,” she said. Steever said she and her team reached out to friends, colleges and university leaders to find the best students to feature on the banners. Steever said she had no idea what kind of words the students would say, which was part of the fun of the project. The students were then photographed in a location that, according to Steever, was a part of their own “world.” Some students are in labs, some are in locker rooms and others are in art studios, Steever said. Steever said she enjoys walking down Commonwealth Avenue and seeing her work showcased on the street.